In this first lesson, you will get a brief presentation of the tools you need to make a website. You have a "browser". 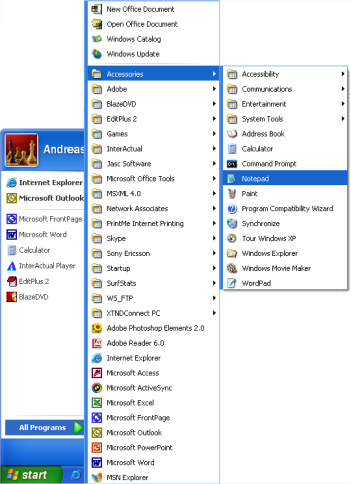 A browser is the program that makes it possible to browse and open websites. Right now you are looking at this page in your browser. It is not important which browser you use. The most common is Microsoft Internet Explorer. But there are others such as Opera and Mozilla Firefox and they can all be used. You might have heard about, or even used, programs such as Microsoft FrontPage, Macromedia Dreamweaver or even Microsoft Word, which can - or claim that they can - create websites for you. Forget these programs for now! They are not of any help to you when learning how to code your own website. If you are not using Windows, you can use a similar simple text editor. For example, Pico (Linux) or TextEdit (Mac). Notepad is a very basic text editing program which is excellent for coding because it does not interfere with what you are typing. It gives you complete control. The problem with many of the programs that claim they can create websites is that they have a lot of standard functions, which you can choose from. The downside is that, everything needs to fit into these standard functions. Thus, this type of programs often cannot create a website exactly as you want it. Or - even more annoyingly - they make changes to your hand-written code. With Notepad or other simple text editors, you only have yourself to thank for your successes and errors. A browser and Notepad (or a similar simple text editor) are all you need to go through this tutorial and make your own websites. Do I need to be online? You do not need to be connected to the Internet - neither while reading this tutorial, nor while making your websites. If you want to avoid being online while reading this tutorial, you can either print it out or simply disconnect from the Internet while reading on screen. You can make the website on your computer's hard disk and upload it to the Internet when it is finished. Go to the next lesson and read about HTML before the fun really starts in Lesson 3.